As I'm writing this, it's Saturday night and I'm thinking back one week to when I was in Charlotte, North Carolina at the Verizon Wireless Ampitheater, front row, center, listening to the Allman Brothers Band. Earlier in the evening, opening the show, was Steve Winwood and his band. I've liked his music in bands starting with the Spencer David Group and then Traffic and Blind Faith. It was so good to hear his hits, so familiar: Gimme Some Lovin', I'm a Man, Higher Love, Dear Mr. Fantasy, and more. The crowd loved them too. He moved with ease between playing the organ and the guitar. There were a number of songs that I didn't know, jazz pieces and a song with a very long drum solo. I wasn't too fond of these, I'm afraid. All in all, I enjoyed his part of the show and hearing his classic hits. At one point I looked at the side of the stage and Warren Haynes and Butch Trucks of the Allman Brothers were watching the performance. About 3/4 into the Allman's performance Steve Winwood came out and performed a great version of the song The Weight and his and Gregg Allman's voices worked well together. 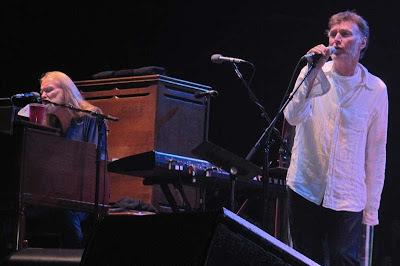 Members of Steve Winwood's very talented band performed with the Brothers on different songs. At one point there were more drummers on stage than I've ever seen in one place before. To add to the variety, the original drummer from The Marshall Tucker Band, Paul Riddle band played on the last song. It was a great night, with lots of wonderful music. I only wish that they had played Trouble No More. Maybe next time. Next post - knitting. And, be sure to come back on Thursday for a book review and give away!